You are currently browsing the tag archive for the ‘CSA’ tag. Yesterday, we picked up our second week of CSA from Evening Song Farm. My goodness, I am just amazed at how things are growing so close to our house and I have, with the exception of tomatoes, essentially just seedlings in the garden. Plus, it was nice to meet Kara’s mom – also a fellow New Jersey-ite – and chat over the farm, the old Jersey neighborhood (since I grew up in the town next door to where she lives) and Vermont. I also ran into another acquaintance while I was there and we had a nice chat about the yoga class in town, which I am now going to definitely give a try. I probably could have been there talking for at least another hour, happily chatting away, except Tim was with me and after he was chatting for a while, politely reminded me that he did have to study for exams. Not only do I get my veggies, but I also get to talk to a bunch of very interesting people. Oh well, off we went. 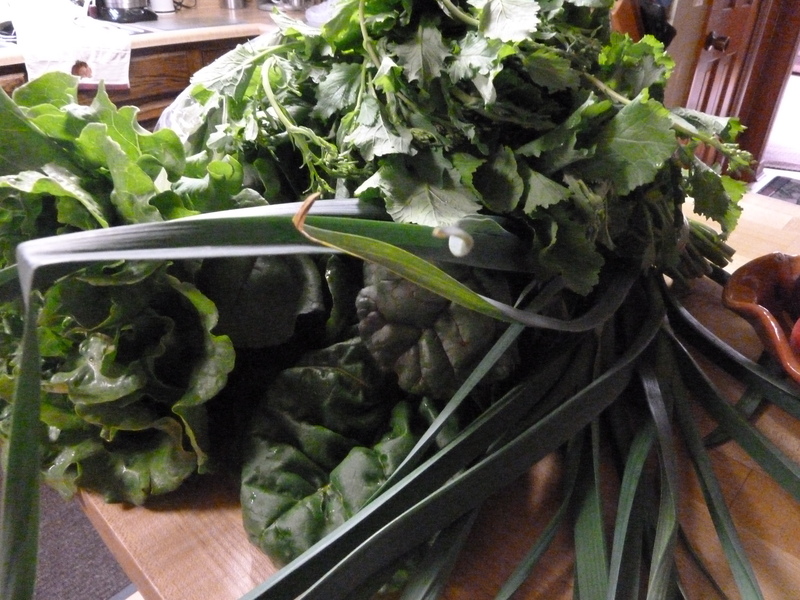 This week I chose a beautiful head of lettuce, baby bok choy, spinach, green garlic, scallions, arugula, and chard. 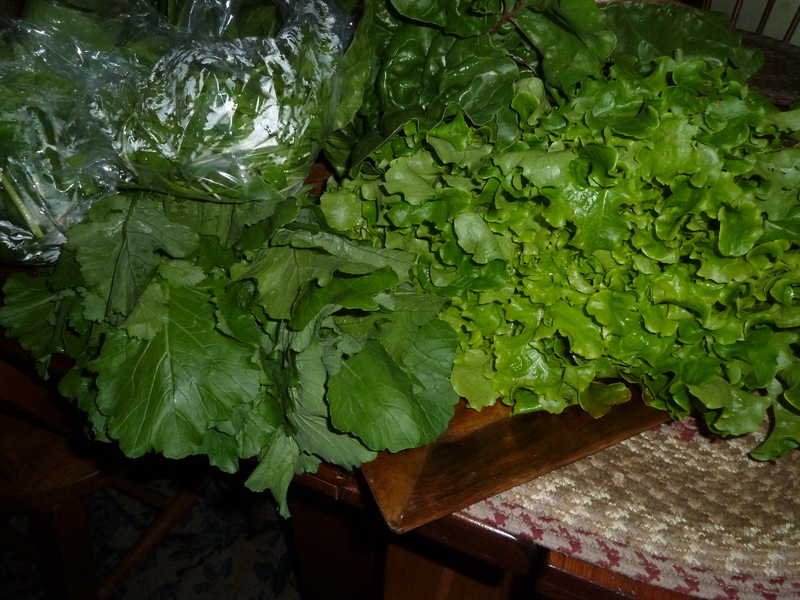 The variety that you can choose from is widely assorted – there were also radishes, salad turnips, mesclun mix, baby lettuce, parsley and kale – although I am sure that I am missing a choice or two. For dinner last night, we enjoyed the lettuce in a salad. 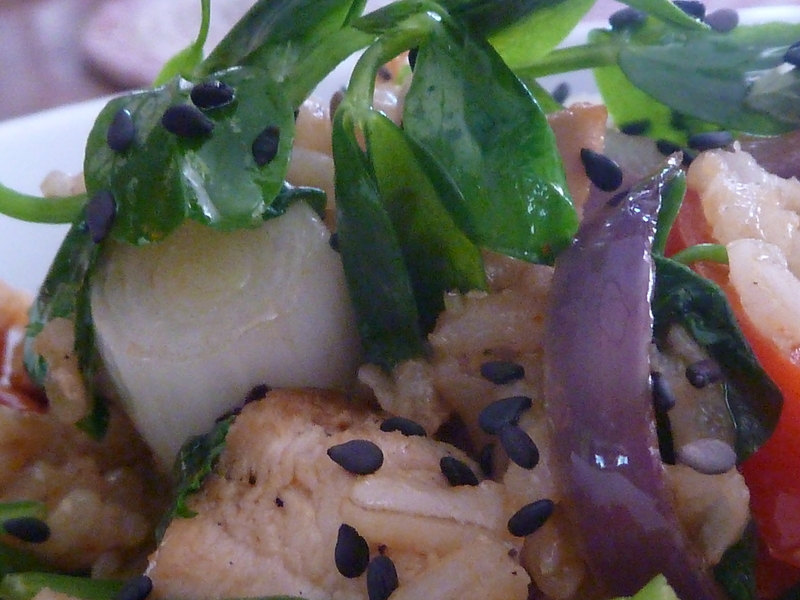 Today, I am sure that I am going to make sauteed baby bok choy again. That was delicious. Saute the garlic in the olive oil at medium heat. Add the bok choy and Sriracha sauce. Saute, stirring constantly until bok choy is tender crisp. There are some very amazing people I get to meet as a result of writing for the Rutland County Express.They are inspirational to me. People often comment that I’m industrious with all the plates I appear to be spinning at the same time, but when I get a chance to interview other people, it really isn’t all that industrious or amazing.What some of my interviewees are up to is far more interesting and inspiring than anything that I appear to be doing. The reason that I love the writing, (well, besides the fact that I love writing) is that I’m not a very outgoing person on my own, so if it weren’t for “having” to find something or someone to write about each week, I might not have found some of the nicest and most inspiring people in our area. It forces me out of my shell and I’m lucky to have a great deal of leeway in what I choose to write about each week, I can be flexible and go along with what catches my eye or something interesting I’ve noticed. For instance, this morning I had an opportunity to sit down with Ryan and Kara of Evening Song Farm which is located just down the road (Vermont-style, of course) on Route 103 by the Cuttingsville/Wallingford border. I have been passing this plot of land which was home to a lot of stuff on the lawn before Kara and Ryan purchased it for the better part of almost a year and watching the transformation of this property. Little by little, fields have been tilled and hoop houses set up, manure was spread, more tilling and then recently, lots of activity and green things growing. The 20-ish couple (Kara is originally from Teaneck NJ – geez– it’s really a small world) purchased the land and started their own farm. They previously ran a successful small vegetable farm with CSA in Pennsylvania. Originally looking to start a farm in northern Vermont and unable to find a suitable spot, by sheer luck they found this property right on the bank of river, which they now call home, along with their adorable puppy Echo. The couple are selling CSA shares for their farm which is really rather neat, since there aren’t any local CSAs close to us. 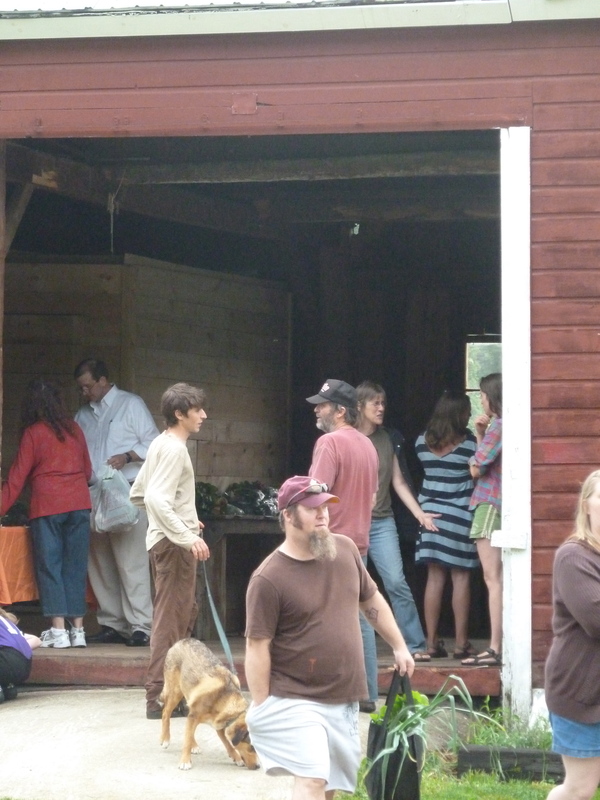 CSA is community supported agriculture and essentially you buy a share, entitling you to a portion of the harvest from the farm during the growing season. The member picks up their share once a week on a designated day. The shares are usually a fixed assortment of whatever is ready for harvest that week, along with accompanying recipes. 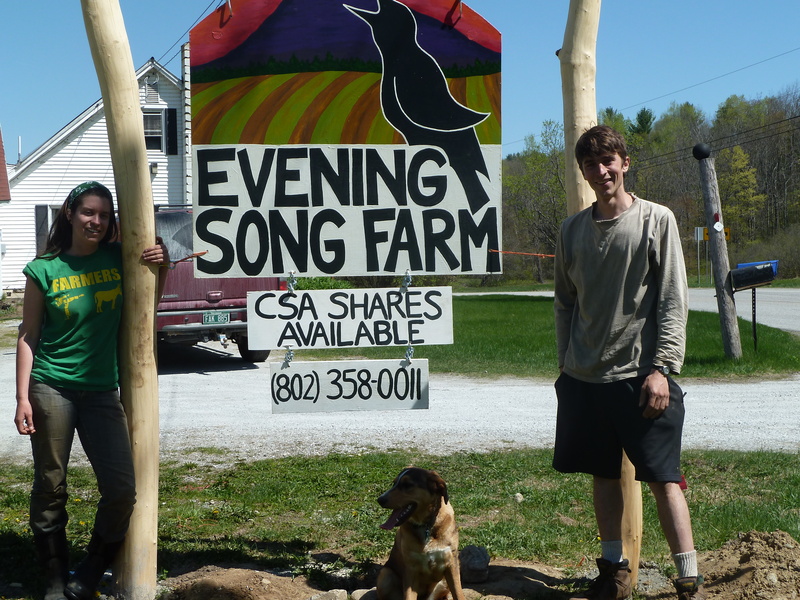 Evening Song Farm is offering a different twist on CSA – a “free choice” share. Essentially instead of getting a fixed basket of veggies and be damned those of you who hate broccoli or tomatoes, etc., Kara and Ryan will give their CSA members choice of what items they want to fill their share for that week (barring some unusual circumstance where a specific crop is very limited). So, the salad lovers, can fill their share with all salad fixings, the broccoli lovers can gorge and the adventurous souls can load up with all sorts of goodies that they’ve never tried before. It’s a great idea even if you have your own home garden, since, let’s face it, we all can’t grow everything that we’d like to. They are also going to sell at the local farmer’s markets five days a week. Today, after our interview and photos, they offered me a bag of pea shoots which I most gratefully accepted. I then rushed home, wrote my article, submitted it and broke into the pea shoots. Damn. They are good. Here is how they were transformed by me into lunch. 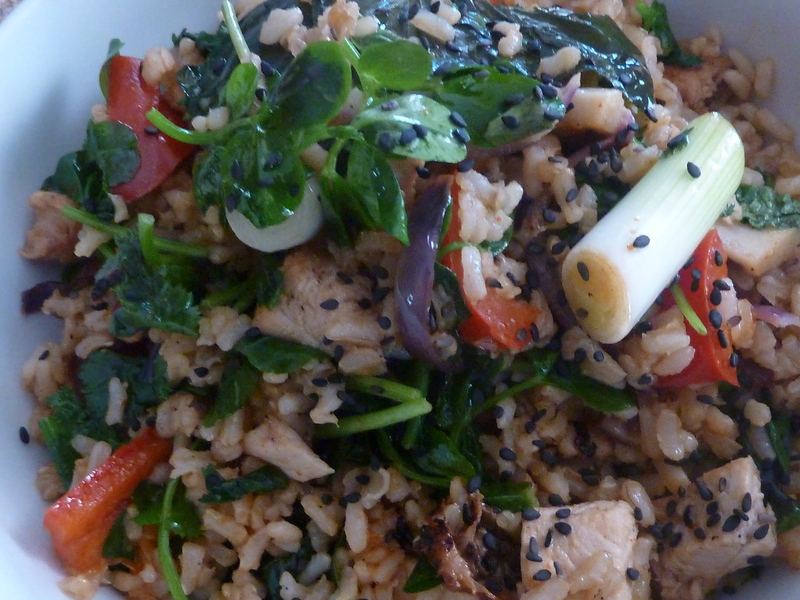 I mean, seriously, look at how nicely Kate & Ryan’s delicious pea shoots fit in with my fried rice mix-together lunch. Lunch was delicious and my morning conversation with Kara and Ryan certainly was amazing and inspiring. I hope that they have a very successful year of farming. By the way, that awesome sign in the picture was designed and painted by Kara and the frame was crafted by Ryan from timber from his father’s grove. Talk about inspirational!